It’s 50 years since the very first Wombles book was published, in September 1968. Author Elisabeth Beresford came up with the idea while walking on Wimbledon Common with her two children, on Boxing Day 1967. They’d driven down to the windmill from their home in nearby Wandsworth, after being cooped up with visiting grandparents over Christmas, on their best behaviour. The full song goes: ‘From Wimbledon to Wombledon is 14 miles; from Wombledon to Wimbledon is 14 miles. From Wimbledon to Wombledon, from Wombledon to Wimbledon, from Wimbledon to Wombledon is 14 miles.’ It was sung by marching soldiers in the First World War, but it’s now more commonly known as a nursery rhyme, ‘From Wibbleton to Wobbleton’. Some of the names came from experience: Elisabeth had flown over the Orinoco river in Venezuela with her husband as a BBC reporter; her daughter Kate had been on a school trip to Cholet in France, and her clever nephew John went to Wellington School in Somerset. In a nod to her mother’s love of royalty, she even gave Bulgaria a middle name, Coburg, after the German town where Prince Albert was raised before he married Queen Victoria. The less well-known character Alderney, who was in the original book but not in the BBC TV series, was named after the tiny, friendly Channel Island where the family loved spending their holidays every year. The Wombles’ old-fashioned values were combined with a pioneering approach to recycling (or reuse), tidying up after ‘Human Beings’ and ‘making good use of bad rubbish’. Influential children’s literature critic Margery Fisher later wrote in her journal Growing Point that Elisabeth Beresford had “done more than graft human characters on to animals”, but had rather “created a new race, as consistent and plausible as the hobbits of Tolkien, whose likeness to ourselves is only one aspect of their existence”. The first edition of The Wombles was published by Ernest Benn Limited in September 1968, costing 18 shillings (about £14 in today’s money). 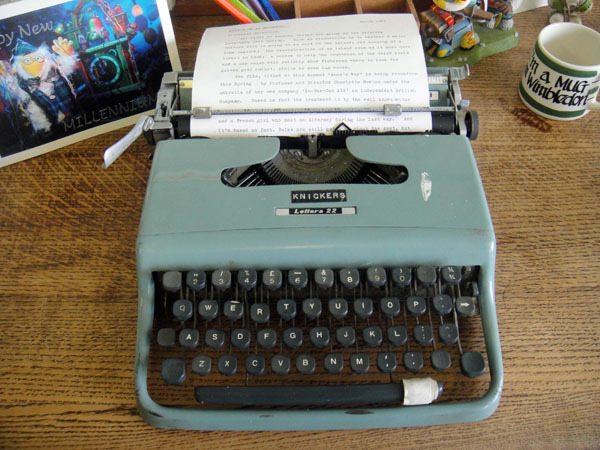 Elisabeth Beresford used her maiden name as her pen name, although she’d been married to Max Robertson since 1949. 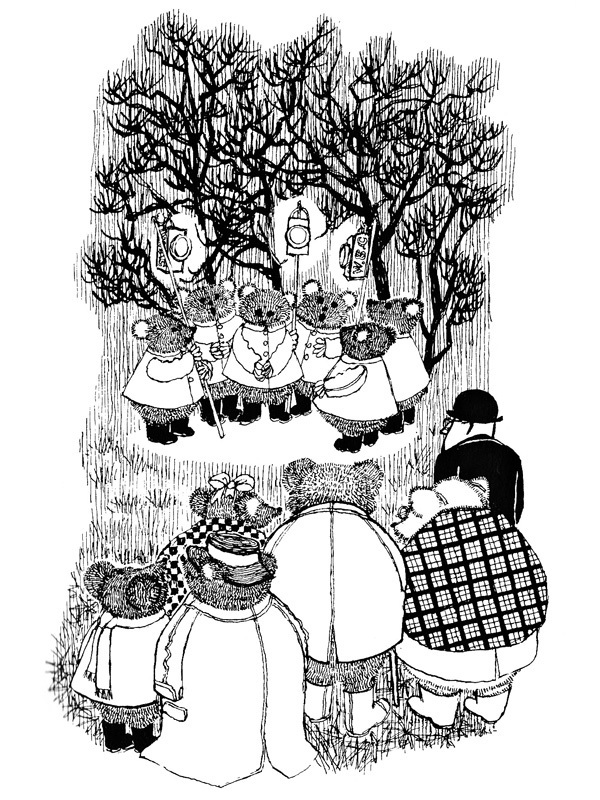 The hardback book had a bright orange dust jacket, with a black-and-white cover illustration of young Wombles singing carols at the Christmas party from chapter seven. These original Wombles looked like very round teddy bears, with short, dark fur, a small pointy nose and small ears. They walked upright on their back paws, and only wore clothes when they needed to keep warm and dry (though Orinoco was fond of his battered straw hat). The colour cover of the 1972 Puffin Books paperback edition shows the Wombles as dark brown, except for Great Uncle Bulgaria, whose “fur has turned snow-white”, and Tobermory, whose “fur was turning grey”. The illustrator was Margaret Gordon, a former art teacher who had studied at St Martin’s School of Art and Camberwell School of Arts and Crafts. One of the first books she illustrated, The Green Children by Kevin Crossley-Holland, won the Arts Council Prize for the Best Book for Young Children. 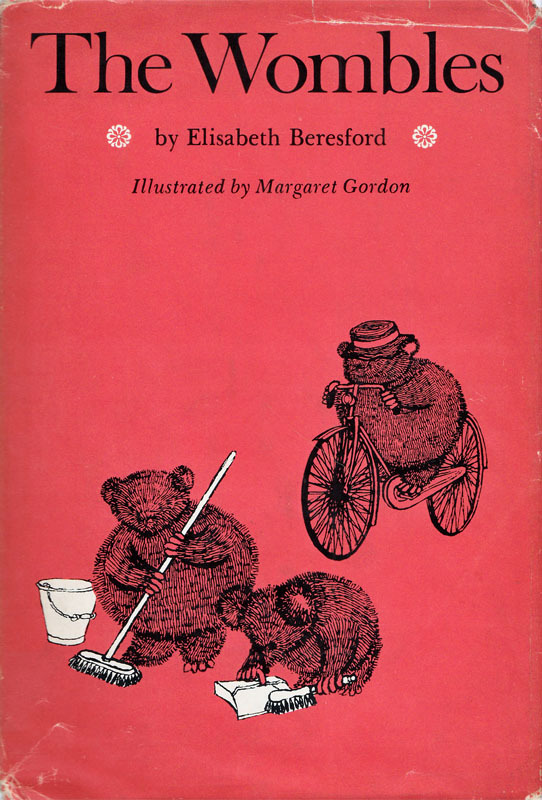 The Wombles was also published in America in October 1969 by Meredith Press, in a similar orange dust jacket but with a different cover illustration, showing Orinoco on his bicycle (from chapter six) and Bungo and Orinoco sweeping up (from chapter four). The book was successful enough to be featured on the BBC’s Jackanory in December 1969, followed by its sequel The Wandering Wombles in 1971. This led to a full TV series being commissioned, which was animated and directed by Ivor Wood at FilmFair. The BBC decided that the Wombles shouldn’t look too teddy-bearish, so Ivor Wood developed their new design with shaggy grey fur, long pointy noses and big floppy ears. Each character had a distinctive hat or piece of clothing, making it easy for children to tell them apart – particularly as many families still had a black-and-white television set. Following the popularity of the TV series and Mike Batt’s Wombles pop group, the illustrations for subsequent books were based on Ivor Wood’s puppets. Ivor himself illustrated The Invisible Womble And Other Stories in 1973, while Margaret Gordon returned to illustrate the remaining novels in this new style, as well as some colour picture books for younger children. Meanwhile, the Ernest Benn hardback editions of The Wombles and The Wombles At Work were updated with new 1975 illustrations by Barry Leith, who worked with Ivor Wood at FilmFair and animated the second TV series. However, the Puffin paperback edition of The Wombles was then reissued in 1977 with new illustrations by Margaret Gordon! She’d grown up surrounded by books and authors – literary friends of her father, novelist JD Beresford. She was born in 1926 in Paris, though the family soon returned to England, where she went to school in Brighton. ‘Liza’ to her friends, her full name was Beatrice Elisabeth Beresford, after her mother (who was known as Trissie). Her father died in 1947, having left the family for another woman in the late thirties. Perhaps the Wombles’ eco-friendly community was partly inspired by JD Beresford, who had explored advanced ideas for his time such as vegetarianism, pacifism and societies based on co-operative principles. Her early books for children were mysteries and adventures, often inspired by her experiences and travels in the exciting new world of television, beginning with The Television Mystery in 1957. Writing two or three books every year, in 1964 she expanded into fantasy with Awkward Magic, the first of what would become the popular ‘Magic series’. She also wrote several romantic thrillers for adults. 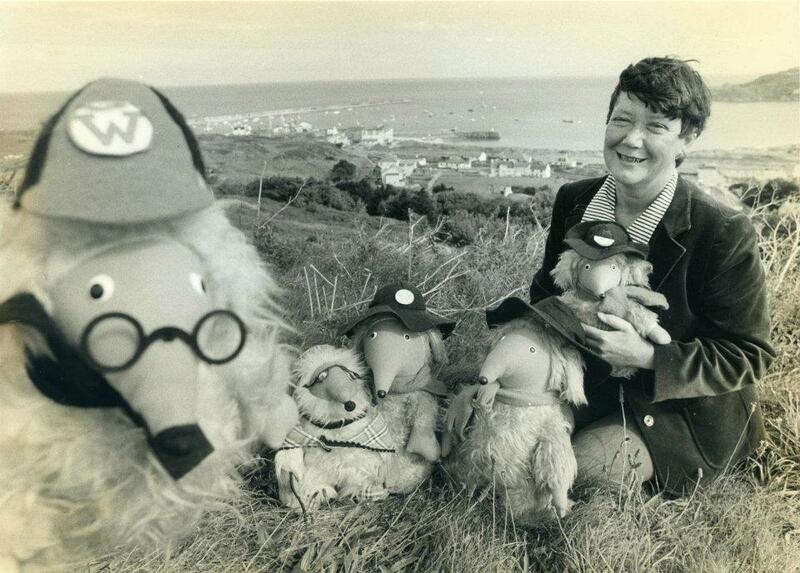 Though she continued writing children’s stories throughout her life, they were overshadowed by the ongoing fame of the Wombles. 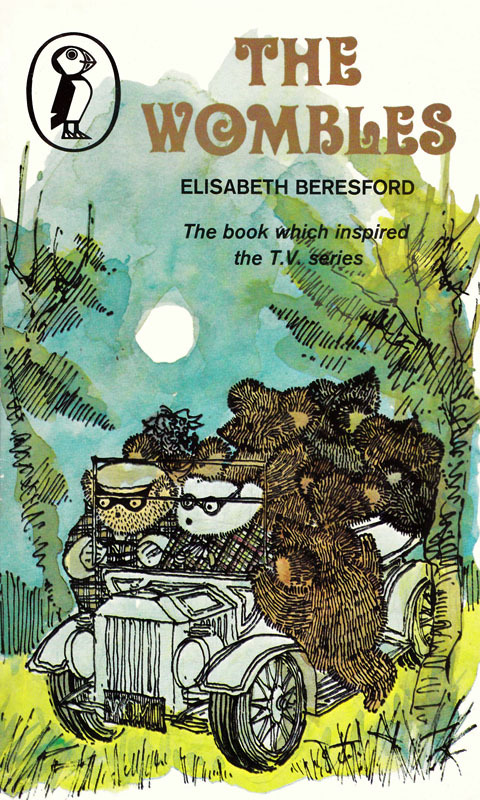 Influential commentator and librarian Marcus Crouch said in Twentieth-Century Children’s Writers in 1978 that “in achieving a runaway success with the Wombles, Elisabeth Beresford has distracted attention from her other, and not less important, writing”. Once their children had left home, Elisabeth and Max Robertson moved to Alderney permanently in 1978, though they divorced in 1984. Elisabeth loved the island’s relaxed way of life and became a valued part of the local community. She died on 24 December 2010 at the age of 84, just as the Wombles books were being reissued for a new generation by Bloomsbury.